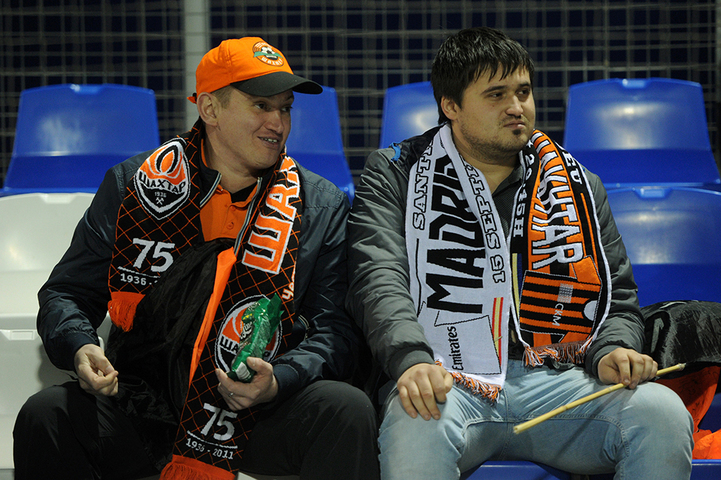 On 5 February, Spain hosted a friendly match between Shakhtar and Dinamo Zagreb. The Pitmen played their second friendly game in Spain with the reigning champions and current leaders of the Croatia league Dinamo Zagreb. It is the club, where Eduardo started his European career, who, as in the game with Piast (3-1), was fielded in the first minute spearheading Shakhtar’s attack. Compared to the game with the Polish side, there were only two changes to the starting lineup: Marlos and Taison were named in the starting eleven. The opening stages of the game saw attacks from the Croatian team, but on 6 minutes the Pitmen opened the scoring: Darijo Srna delivered a cross into the penalty area for Eduardo, who fired the ball first time to make it 1-0. Soon the scorer could have sealed his brace, when he fired a shot into goalkeeper’s hands after a flick-on from Taison. Andriy Pyatov had to make two fine saves. Midway through the half, the Pitmen created two chances: Yaroslav Rakytskyy fired just wide from outside the penalty area, and a Taison headed shot flew just wide of the goal post. On 29 minutes, Viktor Kovalenko drilled a cross at the second attempt, the ball was picked up by Taison, who went on to make it 2-0. Before the break there was also a good free kick from Rakytskyy – just wide of the top corner. During the break, there was one change, made to the Pitmen’s squad: Facundo Ferreyra came on for Eduardo. The start of the second half was marked by enthusiastic performance from Croatian team, and Pyatov made two saves. After that Shakhtar took control of proceedings, launching dangerous attacking moves. Marlos had the most genuine chance after a pass from Taison; the former dribbled past the keeper but held onto the ball for a long time and failed to hit the target. On 65 minutes, the Pitmen’s coaching staff made five changes, introducing completely different defence. A little later a number of changes were made to the midfield. There was long period of time without goal-scoring opportunities. In the closing stages of the game there was a dangerous free-kick from Dinamo (the ball went wide), one of the shots was parried away by Anton Kanibolotskyy. Wellington could have scored too after a long ball from Serhiy Kryvtsov but sent the ball over the crossbar after a powerful shot from the edge of the penalty area. Shakhtar beat Dinamo 2-0 and will play their next match at the training camp in Spain on 8 February with Lokomotiv Tbilisi.